Fall can be a sad time for swimming pool owners, because it's the end of swimming season, time for pool closings, and time to get ready for some really cold weather in Oklahoma. You might be wondering, "Should I cover my pool or not?" Watch the following video to help you understand your options. A good pool closing can give you peace of mind, knowing that your pool will be in great shape when spring time pool opening season arrives. "What kind of damage can a freeze cause?" The following 2 photos show what a hard freeze can do to your pump if it is not running and not winterized. 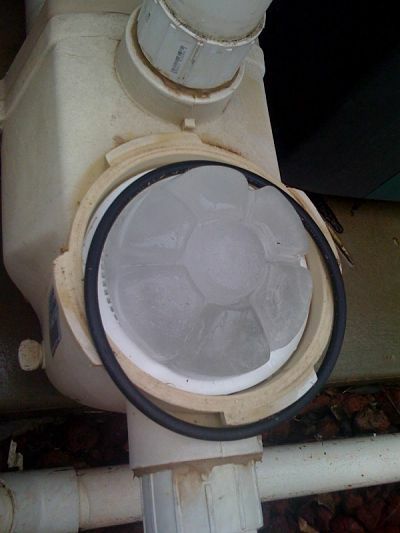 The first photo shows a pump that froze and the ice popped the lid right off the top of the pot, cracking the housing. 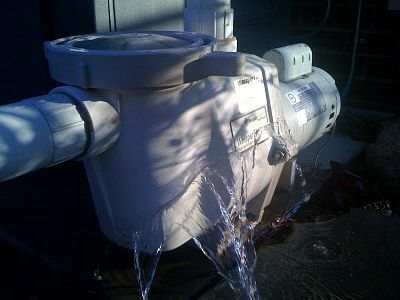 The second photo shows another pump that has thawed out, but also has a cracked housing that is leaking badly. Both of these pumps would have been just fine if they had been running or had been properly winterized. Metro Pool Service has successfully completed hundreds of pool closings over the last 20 + years. Our pool closing service is designed to meet your needs. Some pool owners do some of the work themselves, and we just come in to take care of the parts they need help with like perhaps blowing out the lines and plugging them. Water test. It's important to have the water chemistry in balance when we arrive. Add chemicals. Not much besides chlorine will be added on closing day because the pump won't be circulating. so its important to have the water chemistry in balance when we arrive. Blow out the lines if necessary. Install Winterizing plugs if necessary. Remove skimmer baskets and cleaners. Dip leaves out of pool. Remove ladders and handrails if needed. "What type of cover should I use?" 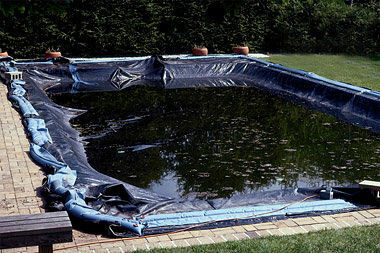 The following photos show the most common ways to cover a pool. The old way of covering pools with a solid cover and water bags in the first photo is not for pool owners who are interested in making their yards more safe for humans or pets. These covers are also unattractive and we recommend not covering this way. You will also need a cover pump for this method of covering. The other cover pictured is a beautiful mesh Loop Loc Safety Cover which requires no cover pump and provides a safe barrier against drowning for humans and pets. Loop Loc covers also keep the leaves out! If Loop Loc covers interest you, click here to learn more. Either way you choose to cover, Metro Pool Service can provide the cover and do the job right.